Prior to the collapse of the Somali Central Government in 1991, the government was effectively and efficiently managed and controlled its airspace and was able to collect overfly charges and revenues from airspace users. However, when the government collapsed, there was no entity to take its place and provide air navigation services. In 1992, the United Task Force (UNITAF), a foreign forces led by the US, took over control and management of Somali airspace. However, when the UNITAF handed over the mission to the United Nations, the United Nations Operation in Somalia (UNOSOM) established an agreement with the International Civil Aviation Authority Organization (ICAO) in 1993 to provide civil aviation services from a control tower located in Mogadishu. The decisions regarding the management of Somalia airspace have been derived from the United Nations Security Council Resolutions Numbers 814 and 837 (1993), which mandated UNOSOM to secure all ports and airports for the delivery of humanitarian assistance. The UNOSOM operation was concluded in 1995, and the ICAO agreement expired at the end of the peacekeeping mission. However, circumstances in Somalia had not improved, and there was no national authority that could take over and manage the Civil Aviation Authority’s responsibilities. Therefore, another entity had to come in and provide such services. In May 1996, ICAO launched a new initiative known as the Civil Aviation Caretaker Authority for Somalia (CACAS) to manage the country’s airspace and provide basic aviation services. The CACAS operated from Nairobi to provide air navigation services on behalf of Somalia. CACAS later changed its name to Flight Information Services for Somalia (FISS) when its mandate expired in 2012 following the formation of the Somali Federal Government. 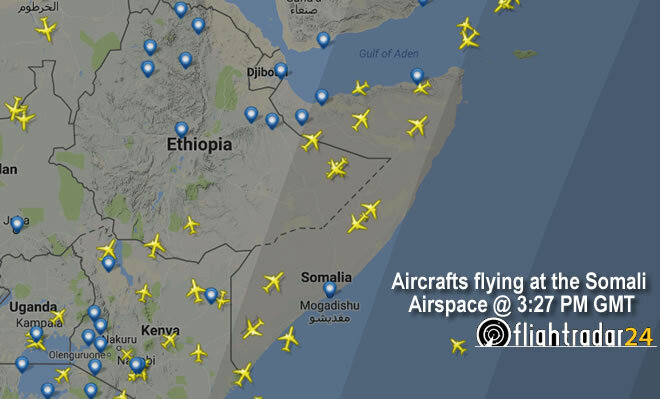 To date, FISS, which uses the ICAO mandate, manages Somalia airspace. Somali politicians have argued that, ICAO has failed to provide major tangible assistance (technically and operationally) to Somalia’s airports. The organisation neglected to establish or assist a functioning civil aviation administration, failed to provide an adequate training programmes for national personnel (capacity building), and was unable to assist in drafting regulations required for the operation and maintenance of civil aviation in Somalia. The Somali government was and is dissatisfied with the way its airspace has been managed by third parties and has begun to take steps in reclaiming it. The first move to reclaim airspace came from the former Prime Minister of Somalia, Omar Abdirashid Ali Sharmarke, in 2010. Sharmarke sent a formal request to the United Nations seeking to regain control of Somali airspace. However, that request was unsuccessful. In 2011, current President of Somalia, Mohamed Abdullahi Farmajo, attempted to regain the control of country’s airspace. This attempt was also unsuccessful. The third attempt to regain control was made in 2013 by Somalia’s former Minister of Information, Posts and Telecommunications, Abdullahi Elmoge Hersi. The minister met ICAO officials in Nairobi and Montreal and announced that Somali federal government would resume control of the country's airspace by 31st December 2013. However, there has been no change, and FISS continues to manage Somalia`s airspace. The fourth effort to regain management was made in 2014 by former Minister of Air and Land Transport, Said Jama Mohamed. Said announced that the Somali federal government had regained the control of its airspace after reaching an agreement with ICAO. The minister added that, the airspace would be managed from Mogadishu. However, this attempt was unsuccessful, and FISS is still in charge of Somalia`s airspace. This year, the newly appointed Minister of Air and Land Transport, Mohamed Abdullahi Salad, has visited Nairobi and Montreal to discuss the issue of transferring the management of the airspace from FISS to the hands of the Somalia government. The minister has met with Somali technicians and air-controllers working for FISS in Nairobi and informed them that they should prepare for relocation to Mogadishu by December 2017. Will the new minister succeed where his predecessors have failed? There are three options available to Somali government in terms of airspace. The first option is to leave the situation as it is now. In order to achieve and maintain a safe and efficient flow of aircrafts within Somalia`s airspace, Somalia must let FISS manage the airspace as they do now until Somalia is fully ready to takeover. Somalia is not the only sovereign state whose airspace is managed by a third party, such as ICAO. During the Haiti earthquake in 2010, the US with the approval of the UN/ICAO, assumed control of Haiti’s airspace. Hungary is currently temporarily managing Kosovo airspace to provide air navigation services on behalf of the state. However, this option is not acceptable to Somali officials and citizens, as they believe that, some senior officials at ICAO and FISS regarded the temporary control of Somalia’s airspace as permanent and show little interest in handing responsibility back to Somalia. Somalis argue that there has been no major upgrading of Somalia’s air traffic management facilities or capacity building. However, the temporary centre in Nairobi is constantly upgraded and equipped with the latest technology. The main concern Somalians have is that the revenues generated by Somali airspace are spent on the salaries of UN/ICAO/FISS employees, and little is left to train Somali aviation officials or repair the country’s ageing airports. In 2011, an average of 90 aircrafts used Somalia airspace per day. Today, that figure has increased, as more airlines have started to use Somali airspace. For example, Qatar Airways alone uses Somalia’s airspace 15 times a day as an alternative route, due to blockages imposed by Saudi Arabia led coalitions. Therefore, the revenue generated from the use of the airspace has increased, and Somalia cannot afford to lose these funds. The second option is to delegate and assign the management of the country`s airspace to another third party state or institution. As established by the Chicago convention, each state is entitled to delegate its relevant airspace sovereignty rights to external bodies. To clarify, national sovereignty cannot be delegated, but the provision of air traffic management services can be. This delegation is not an abandonment of the country`s sovereignty, but rather a way of fulfilling the obligations of airspace sovereignty by making the using of the airspace safer for users. For example, New Zealand provides air traffic control services for some small Pacific states, such as the Kingdom of Tonga. e state delegates air navigation service to a foreign body, the delegating state retains liability. The delegating state must ensure that the service provider is appropriately regulated, certified, and subject to sufficient supervision. All delegation agreements can be withdrawn with immediate effect in the event of a crisis or serious threat to national security. As the delegation of the management of airspace to other states is legal and widely practised, can Somalia delegate its airspace to be managed by countries such as Kenya or Ethiopia? Legally, Somalia is entitled to do so, but due to Somali pride, this option is unacceptable, particularly if delegating to Ethiopia or Kenya, two hostile neighbouring countries. The final means of regaining control is to pursue and commit to regaining complete control and management of the airspace regardless of how long it might takes. As mentioned before, under the Chicago Convention, each state has complete and exclusive sovereignty over the airspace above its territory. The control and management of the country’s airspace should be regained and transferred from FISS back to Somalia as soon as possible, but this task is not as simple as it may appear. According to international law, Somalia Federal Government is the only entity that is entitled to negotiate ICAO in the process of regaining airspace. This law means the airspace above Somaliland officially belongs to Somalia. However, Somaliland is essential in the process of regaining control of Somalia’s airspace management. As the airspace is belongs to all Somali citizens, consensus must be established. This consensus means greater cooperation between Somalians is necessary, in order to create one influential voice and regain control of the airspace. Since 2012, there have been several meetings and talks between Somaliland and Somalia, including Istanbul II Communiqué, where the two parties agreed on establishing the Air Traffic Control Board (headquartered in Hargeisa, Somaliland) and four members of technical committee (two from Somaliland and two from Somalia). This agreement was supported by the United Nations envoy in Somalia/Somaliland and the head of the UN Assistance Mission in Somalia at the time, Nicholas Kay, who described the agreement as a model for other areas of mutually beneficial cooperation. However, since the establishment of the agreement, Somalia has sought to reclaim control and management of the airspace without taking into account previously signed agreements. Somalia is using its sovereign rights and legal basis as an autocratic means to ignore Somaliland as a partner. This move has angered Somaliland, who calls for the establishment of the joint Air Traffic Control Board with the Centre in Hargeisa, as agreed during the talk in Turkey, or to establish two entirely distinct and separate centres in Hargeisa and Mogadishu respectively, or the UN, or another third country to provide air navigation services until an agreement is reached between Somalia and Somaliland. Because of tension between Somaliland and Somalia, in 2013 Somaliland has banned all UN flights from landing at its airports and threatened to close its airspace to UN flights if the Istanbul II agreement is not implemented. Practically, Somaliland is not capable to close upper airspace (legally and technically) or take military action against airlines that defy the ban. However, this threat could indicate that Somalia’s airspace is an unsafe conflict zone, and thousands of commercial flights that currently use the airspace could be rerouted. This rerouting would result in the loss of overfly revenues and may give reason for ICAO and FISS to continue managing Somali airspace for as long as possible. Neither Somaliland nor Somalia wants the airspace to be closed, to be delegated to third parties, or to remain in the hands of ICAO and FISS. Therefore, Somalia and Somaliland should join together and make compromises and brave decisions in order to accomplish the long overdue goal of reclaiming the country’s airspace.